The day starts off with an “all-you-can-eat” breakfast at Shaw’s. The A.T. Thru-Hikers’ Companion uses the abbreviation AYCE for such spots, since they tend to be popular with famished hikers. Breakfast starts at 7 and goes until around 8ish, so it’s really all-you-can-eat-while-the-grill-runs-and-you’re-waiting-in-line; I miss the memo about the start time and head down near the end of it, but I get a good helping of food, to be sure. Next, I hit up the Monson General Store; the Companion says it offers “long-term resupply”, but that’s something of a lie: it’s more like “long-term resupply, but options are limited”. (Had I been around I could have joined a caravan to Greenville for shopping at real stores, but I didn’t happen to be at Shaw’s when it left.) In particular they don’t sell peanuts, M&Ms, or raisins in reasonable bulk, so I am trail mix-less for the next stretch of trail. I continue in the tradition of Knorr dinners and try to scrounge up a bunch of granola bars and such for breakfast and snacking; lunches are tortillas with peanut butter and honey. Also, tuna in a pouch is nothing short of miraculous when added to some of the Knorr dinners. Last, I visit the post office to pick up a box in which to put stuff I don’t need; that overheavy pack cannot be tolerated. I sort of combine lunch and dinner into one by eating a BBQ pork sandwich from Spring Creek BBQ in town. There’s a pub down the street which I consider visiting but eventually decide to be cheap; I’m not sure that was a great decision, in retrospect. The rest of the ice cream from yesterday tops off the day. That done, I proceed to packing. Among the things I drop are a third set of hiking clothes (leaving two sets, one of which is for use after I shower in towns I visit, plus fleece pants and sweater for cold-weather use), bowl and cup (titanium conducts heat extremely quickly — you can drink boiling water straight from the pot with a little care, so the cup is superfluous) and an extra spoon, and a pack towel intended for use in towns. I’ve probably forgotten a thing or two, but that’s about the gist of it, all total about four pounds dropt. Food packs up easily enough too, and newly-clean clothing rounds things out. On the porch other thru-hikers are fashioning alcohol stoves from pop cans for the first time; they’re welcome to it, but I’ll take known-working options over untested options when doing a thru-hike. It continues intermittently raining today while I’m going through town today, raising fears about fords and rivers down the trail. 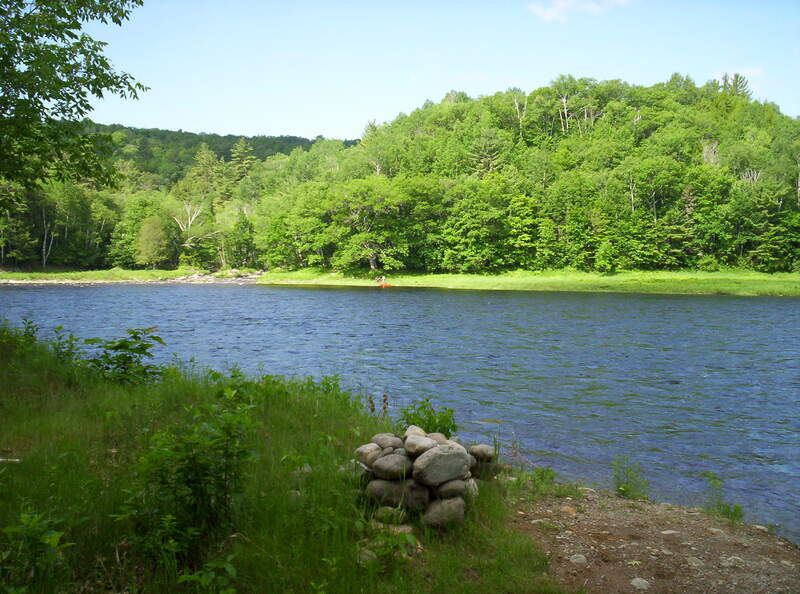 The immediate next fords are of the Piscataquis River, and a bit later is the Kennebec. 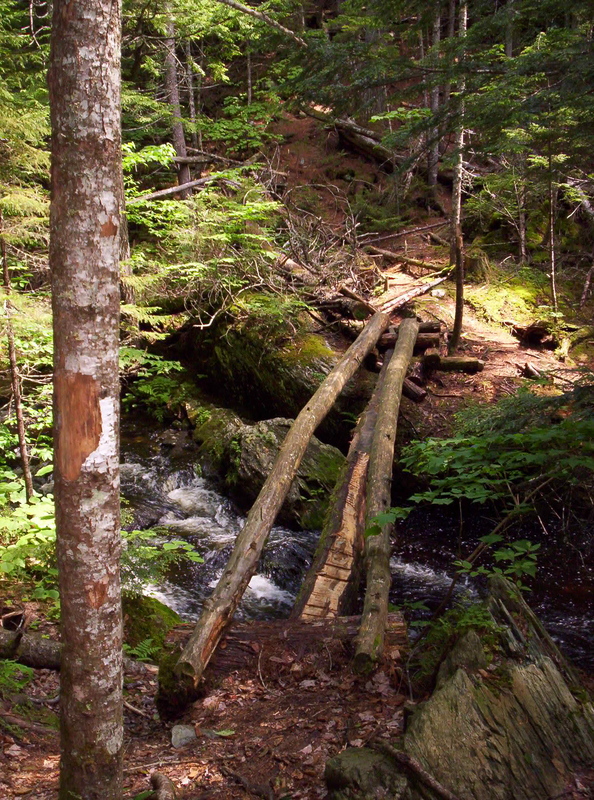 The latter is billed as “the most formidable unbridged water-crossing on the Appalachian Trail” by the Companion, which ominously notes a thru-hiker drowned in 1985 trying to ford it. The current ferry service started the next year as I understand it; it’s basically a guy with a canoe and some life jackets, with set hours of operation depending on time of year. Anyway, the water’s so high on the Kennebec the ferry isn’t even running, which could be interesting later down the trail. 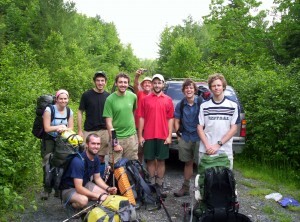 The Piscataquis is unfordable, so we “yellow-blaze” just past the last ford of it, shaving 12.1 miles off the trail. Since it’s a weather-related shave I feel no guilt, although some will doubtless wait it out as purists. The mud returns, along with a spat of rain, and we hike over a small mountain and into the lean-to ridiculously early in the day. By my watch the ten miles of hiking take five hours, so I sustain a two-mile-an-hour pace — madness! My first fuel canister finally runs out on dinner; I started with two 15.9oz canisters (one full, one full minus some small number of meals) not knowing how far they’d go, and I’ve been amazed to see how long it took to empty just one. We share Bald Mountain Brook Lean-to with essentially the same people from the hostel in Monson, minus Two-Liter and Lucky (who stayed at a different spot in town), who decide to take it easy since the Kennebec ferry’s out anyway. Discussions about the right to bear arms, habeas, Iraq, and other such fun topics fill out the night — the Brit provides a unique perspective on the former, which to a large extent doesn’t exist in Britain. Today’s a long but pretty easy day, past a Moxie Pond and over a mountain but otherwise fairly easy, if long. The others get out earlier than I do, planning to meet up at a takeout place with milk shakes in Caratunk. I go slower and end up arriving at U.S. 201 after 6, when the place closes; I head west intending to stay at a hostel listed in the Companion, but as it turns out, the place is closed. Perhaps I should have checked the errata before leaving Monson. A mile further up the road (two total) is Northern Outdoors Campground, so I grab a tent cabin (tarp on a stereotypical house skeleton, with a light, a screened door, and four beds with mattresses inside) there and eat a dinner at the accompanying brewpub — a BBQ burger with a pint of their home-brewed “Class V Stout”, which the table placard describes as their version of an English stout. I try that because it sounds essentially like a Guinness, and Guinness is good. It is, but the final verdict is that it’s not a Guinness. After a breakfast from my trail supplies, I head up to the brewpub to refill water bottles, access the Internet (mostly epic fail since their computer doesn’t allow USB hookups, so I can’t dump pictures), and inquire about a shuttle back to the trail. Turns out the time to ask for the shuttle was the previous night, but at two miles it’s not worth the hassle of seeing if they’re in a good mood, so I start walking. I arrive at the ferry point, 0.4 miles up the trail, at around 10:30 to find the ferryman there waiting to direct people accordingly. Ferry’s still out, but wonder of wonders, it’s set to resume the next day, so I decide to take an unplanned zero and wait it out. I hear a few horrendous stories about mad efforts to not wait — a $220 taxi fee for eight hikers, a river rafting trip for two others, the Honeymooners who exploit a local connection somehow to go around the river — and decide waiting is an easy choice. I could head back to the campground, but I don’t have a good reason to spend the money to stay there when I have a tent that’ll work fine in the current nice weather, so I hike back up the trail half a mile to get out of the no-camping zone and set up. I do some reading (the famous Federalist Paper No. 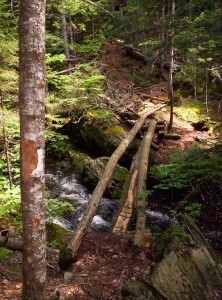 10, accompanied by an unending mental chorus of, “but, but, parties!”) and sleeping, cook a trail dinner, and sleep. I wake up late in the morning since the ferry doesn’t start until 9, passed by Two-Liter (post office-bound to get a mail drop, then to the ferry) and Lucky (ferry-bound) as I pack up; their leisurely pace gets them to the Kennebec right on time. I arrive right at 9 to see the first crossing underway, with Lucky and the aspiring women’s record-setting trail hiker (to hike the entire trail — was averaging around 44 [!] miles a day last I heard) as passengers. An hour, a life jacket, a release form later, and I’m across the beast. Even now the water’s still pretty high — I have no idea how you’d actually ford sans ferry. The claim is you can do it by wrapping your pack in an inflated sleeping pad and floating/swimming it across, but that just seems like insanity of the first degree. 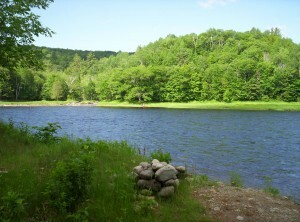 A view across the Kennebec River, the largest unbridged water crossing on the A.T.
Hiking’s easy; I stop for lunch at the first lean-to after the crossing, but it’s too early in the day for a stop at only four miles. I instead continue another ten to West Carry Pond Lean-to, around a few lakes along the way, chased by something buzzy (fly? bee?) around one of them. I share the lean-to with Jukebox, a fellow southbounder, whose planned pace is 8 miles a day (for now, ramping up in later sections of trail) but who is doing much better in practice. He’s got a fire going, which I use to try to dry out my boots (they’re far enough back to prevent burning or melting that I’m not sure it does much). Jukebox is up and out early; I follow shortly thereafter. Today’s big feature is Bigelow Mountain near the end of the day. I notice while hiking today that my legs don’t really hurt, even very late in the day — I’m at the point where I’ve been out long enough that things stop aching to a large extent. You can imagine this happening when you’re on a week-long trip, but you never quite hit it in that little time. The ups and downs agitate the knees, ankles, feet, and perhaps a tight calf muscle or two, but otherwise the legs, hips, etc. are all in spiffy shape. Hiking goes fine, but it’s getting late in the day when I top the first of two peaks of Bigelow. The lean-to I want to hit is past the second peak, and it’s late, and there’s Avery Memorial Campsite between the two peaks, so I call it a day there after filling up at a slow-dripping spring just before the site. This is high-elevation camping in fragile areas, so my only option is a tent platform, which doesn’t work well with a non-freestanding tent but which can be made to work, given enough effort — so I do. Dinner and sleep follow quickly. I’m up pretty late today, and not hitting the lean-to yesterday makes me decide to stop in Stratton just down the trail a bit for the night, rather than just for food as I’d intended. Since I don’t have a cell phone and Stratton is five miles away, this is my first true hitch into a town, after about twenty minutes of waiting (about average from what I hear). I get in, take a shower, buy food plus a half gallon of apple juice, two pounds of strawberries, a can of pineapple, six or so apples, and two cartons of yogurt for food while I’m in town, and unwind. The Honeymooners and Jukebox are also here for the night as well, and Jukebox is here a further day beyond that (at least). While Batman Begins plays in the background on the TV, I pack up my food, offload pictures from the camera, make some posts here, and then go to sleep for the night. This section of trail was pretty quick and easy: nothing too big in terms of elevation, not too much food to carry, and the miles just flew by. Things get more interesting in the next section of trail. Pictures are still forthcoming on parts of the last update; it takes some effort on my part to get them into place, sadly. As before, I’ll notify here when I complete that work. I don’t know when you plan to be in Pennsylvania, but turns out the trail goes by about 20 minutes from my house, so feel free to drop me a line if you’d like to stop by for dinner. I’m just south of Palmerton, PA (the trail crosses route 248 there). haha.. how’s the bugs? i imagine they aren’t pretty? [They’ve been horrendous on a handful of occasions, but for the most part the rain kept them away. In the 100-Mile Wilderness I could have used bug netting for my head, but since then I really haven’t needed it. I’m still carrying bug dope, but I actually have strongly considered dropping it, because I haven’t touched it in several weeks.